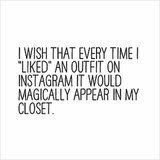 While we definitely enjoy perusing pictures of must-have clothing, street style, and well-dressed babies via Instagram, we love us a good fashion quote. The best ones we've found are both relatable and funny, something that makes us nod in agreement and accidentally chuckle in a crowded room. Plus, we can't forget the bits of wisdom and encouragement that help pump us up for the day ahead. So to help you start your morning with a laugh, we've rounded up a few of our favorite quotes from our own Instagram account. Just keep on scrolling - a large dose of real-girl, real-life musings is coming your way. Oh, and if you want more, you can always follow us, too. Go to Karl's World For Less Than $25! Celebrity Instagram: Glastonbury 2013 Fashion Special!